Marie-Therese Connolly, a 1984 School of Law graduate who received a prestigious MacArthur Foundation grant in 2011, returned to campus this week as a Daynard Distinguished Visiting Fellow. Photo by Brooks Canaday. Abuse is endemic among the nation’s senior pop­u­la­tion, with a large per­centage of older Amer­i­cans suf­fering from often-​​unreported cases of abuse, neglect, or exploita­tion, according to School of Law alumna Marie-​​Therese Con­nolly. And with the number of Amer­i­cans entering their golden years about to sky­rocket as the baby boom gen­er­a­tion ages, Con­nolly is leading the charge to pro­tect one of society’s most vul­ner­able cohorts. 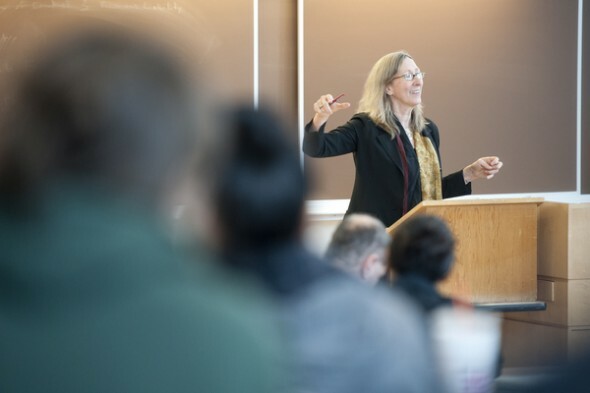 Con­nolly is back at North­eastern this week through the Day­nard Dis­tin­guished Vis­iting Fel­lows Pro­gram, which brings notable prac­ti­tioners of public-​​interest law to campus for a three-​​day visit. Con­nolly deliv­ered a lec­ture to stu­dents and fac­ulty on Monday and will par­tic­i­pate in a round­table dis­cus­sion on elder abuse on Wednesday at noon in 240 Dockser Hall. 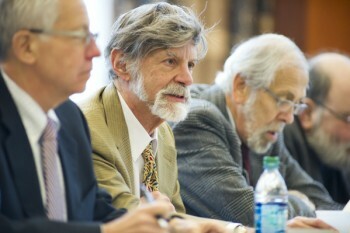 Richard Day­nard, center, a Uni­ver­sity Dis­tin­guished Pro­fessor of Law, and his wife, Carol Iskois Day­nard, sup­port the Day­nard Dis­tin­guished Vis­iting Fel­lows Pro­gram. Photo by Brooks Canaday. The bian­nual series was estab­lished in 2004 and is sup­ported by Richard Day­nard, Uni­ver­sity Dis­tin­guished Pro­fessor of Law, and his wife, Carol Iskois Day­nard. In October, the series fea­tured Leslye Orloff, director of the National Immi­grant Women’s Advo­cacy Project. Con­nolly, who is director of the Life Long Jus­tice ini­tia­tive at the Apple­seed Foun­da­tion and a senior scholar at the Woodrow Wilson Inter­na­tional Center for Scholars, said elder abuse is a growing problem that lacks a cohe­sive infra­struc­ture for advo­cacy. Without strong orga­ni­za­tions working to combat the issue, it is dif­fi­cult to frame a national con­ver­sa­tion, draw aca­d­emic atten­tion, or craft mean­ingful solu­tions, she explained. Her pro­posed Elder Jus­tice Act—which was con­sid­ered by Con­gress five times before a lim­ited ver­sion was enacted in 2010—is mod­eled after 1974’s Child Abuse Pre­ven­tion and Treat­ment Act and 1994’s Vio­lence Against Women Act, both pieces of leg­is­la­tion whose impact still res­onates strongly today. Con­nolly said law stu­dents can approach the issue of elder abuse from myriad angles, working any­where from within grass­roots orga­ni­za­tions to posts at the highest level of fed­eral gov­ern­ment. Because most Amer­i­cans do not con­sider elder abuse to be a per­sonal issue, the cause needs legal pro­fes­sionals to serve as advo­cates who can influ­ence change. Con­nolly said North­eastern was the per­fect place for her to hone her skills and foster an advocacy-​​focused mindset. This entry was posted in Admissions, Emily - Office of Admissions and tagged Boston, Elder abuse, Elder Justice Act, Law, Law school, MacArthur Foundation, MacArthur Genius Grant, Marie-Therese Connolly, northeastern, northeastern university school of law, NUSL, Richard Daynard. Bookmark the permalink.